For more in-depth studying, the U.S. 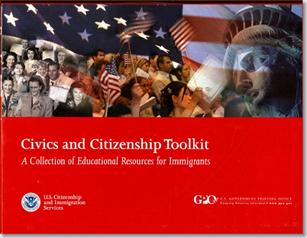 Citizenship and Immigration Services has created a Civics and Citizenship Toolkit, a collection of educational resources and information for immigrants to the United States. This toolkit contains settlement information for new immigrants to the United States, information on the naturalization process, study materials for the naturalization test, reference materials on the rights and responsibilities of U.S. citizenship and U.S. history, teaching guides and resources, flash cards, and more. You can also purchase the Civics and Citizenship Toolkit and Learn About the United States publications directly from the GPO Bookstore or contact a Federal Depository Library for a copy.